The Federal Reserve is expected to leave its influential interest rate unchanged after the central bank’s top officials wrap up their meeting in Washington today, following a rocky start to the year in the financial markets that is forcing them to reevaluate their plans. The Fed raised its benchmark interest rate in December from near zero to a range of 0.25 to 0.50 percent — the first increase in nearly a decade. The move amounted to a vote of confidence in the nation’s economic recovery, and officials at the time indicated they anticipated hiking four more times this year. Latrobe city officials Monday defended the use of public money for certain improvements to and projects for the community. During council’s voting meeting, Irving Avenue resident James Bolton questioned borrowing and spending, from street equipment to recreation. “We can’t keep borrowing money. You get money and you save it. You don’t go out and spend it,” Bolton said. Earlier in the meeting, council agreed to purchase a street sweeper from Golden Equipment Co. of Mars. The $211,524 cost will be financed through the low bidder, 911Leasing.com, at an interest rate of 2.7 percent over five years. The purchase is dependent on the state Local Government Unit Debt Act’s approval. BRUSSELS — European leaders said Monday morning that they had reached a deal meant to resolve Greece’s debt crisis and avert a historic fracture in the Continent’s common currency project. 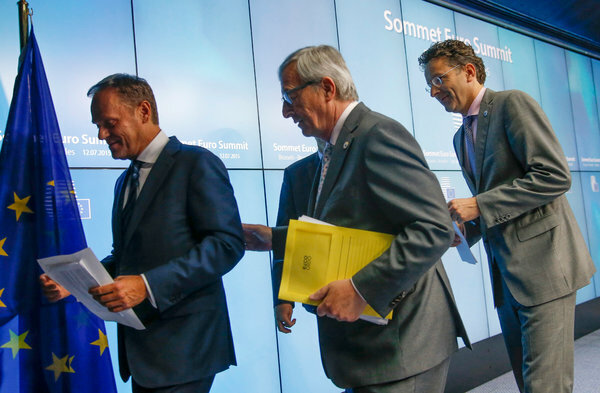 “EuroSummit has unanimously reached agreement,” Donald Tusk, the president of the European Council, wrote on his Twitter account shortly before 9 a.m. on Monday. The new bailout for Greece would involve “serious reforms” and “financial support,” he wrote. The deal announced early Monday allows only the start of detailed negotiations on a new assistance package for Greece. But the prospect of a new bailout program was expected to give the European Central Bank the leeway to continue channeling sorely needed emergency funding to Greek banks hollowed out by a long economic slump and the withdrawal of billions of euros in recent months by panicky account holders as the country’s financial crisis worsened. The agreement aims to provide Greece with its third bailout package in five years. Tough terms, demanded by Germany and others, are meant to balance Greece’s demands for a loan repayment system that will not keep it mired in recession and austerity budgets, against creditors’ insistence that loans worth tens of billions of euros not be money wasted. Months of testy negotiations, and the inability of Greece to live up to the promises made in its previous bailouts had put a cloud of distrust over the weekend’s discussions. An accord would end five months of bitter negotiations that raised concerns that Greece would be the first country to be forced out of the euro currency union — a development that proponents of European unity had sought desperately to avoid. “The advantages far outweigh the disadvantages,” Chancellor Angela Merkel of Germany told a news conference, explaining her decision to accept the deal and recommend that the German Parliament also grant its approval. “The country which we help has shown a willingness and readiness to carry out reforms,” said Ms. Merkel, referring to Greece. As part of Greece’s commitments, Ms. Merkel said, a fund will be created to use the proceeds from selling off assets owned by the Greek government to help pay down the country’s debt. That fund would be “to the tune of” €50 billion, she said. Greece will be required to also seek assistance from the International Monetary Fund and agree to let the organization continue to monitor the country’s adherence to its bailout commitments. The Greek government had resisted a continued role for the I.M.F., seeing the fund’s involvement as unwanted meddling. The Greek Parliament will also be required to approve the terms of the agreement “without delay,” according to the draft document that was circulating Monday morning. One of the sticking points in the weekend negotiations had been a demand that the Parliament sign off on any deal by Wednesday, but that requirement appears to have been relaxed. He added that eurozone finance ministers would “as a matter of urgency discuss how to help” Greece meet its short-term financing needs. That appeared to be a reference to ensuring that Greece, which is nearly bankrupt, can make large payments to lenders including the European Central Bank that are due in the coming weeks. During the marathon negotiation session, Alexis Tsipras, the Greek prime minister, struggled with economic overhauls that were demanded by the creditors but that his left-wing government will find difficult to sell at home — just a week after Greek voters overwhelmingly rejected softer terms in a referendum. European stocks rose and the bond market calmed on Monday morning just moments after European leaders said they had reached a deal. There was no euphoria, however, as investors waited to see how the tough agreement would be put in place. Niki Kitsantonis contributed reporting from Athens, and Alison Smale from Berlin. Florida cops have captured two robbers who were on their attempt to flee after seizing an ATM from the local bank with the help of a stolen backhoe. The robbers were identified as Francisco Hernandez, 53 and Jesus Antonio Sanchez, 50 both residents of Clewiston. They are currently being held at the Polk County Jail on grand theft auto charges as reported by the Orlando Sentinel. Hernandez and Sanchez are believed to have stolen the backhoe from a local construction site, before heading to Winter Haven and capturing an ATM from the wall of the CentreState Bank. The entire incident has been recorded by a surveillance camera near the ATM. The footage has confirmed the robbery being taken place on Friday midnight. The suspects however claim that they were innocent as they had been collecting scrap metal and were unable to recall where items pulled by the investigating deputy had been located. Hernandez was previously known to officials due to an outstanding Hendry Country arrest warrant for violating his probation. Sanchez was also on probation for a previous grand theft offence. According to a bank representative, the suspects did manage to take the ATM from the wall but they were in no attempt to open it. Backhoes are generally used to excavate or dig and is usually mounted on tractors and front loaders. The suspects have been referred to as “brazen” for their shameless assault on the ATM. The motivation of the two men remains unclear and the two men remain in holding at Polk County Jail. Recent reports suggest that ATM theft is on the rise as criminals turn to stealing ATM’s rather than swiping credit cards. In 2010 in Texas, 100 ATM machines were stolen. Bank robberies appear to be down.